Mr. Gardner presented legacy WealthScript code in the article, so we’ll provide WealthScript Version 6 C# code here. 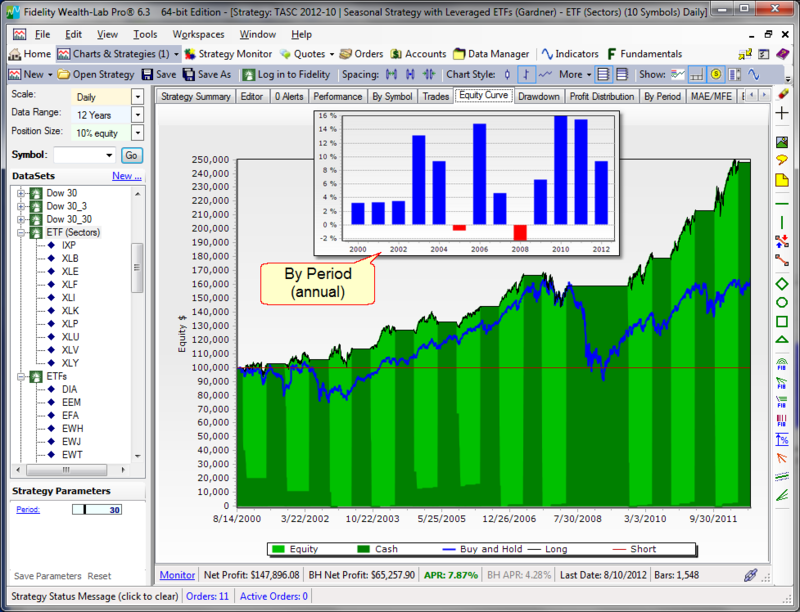 Not satisfied testing with the short history of the leveraged ETFs (DBC and DDM) since 2006, we ran 12-year (8/2000 to 8/2012) simulations on 10 Sector ETFs (IXP, XLB, XLE, XLF, XLI, XLK, XLP, XLU, XLV, and XLY) using 10% of equity sizing on $100,000 starting capital, optimizing on the moving average period. While all periods produced solid returns, a smooth profit peak occurred when using a 30-bar period. With a maximum equity drawdown of only ­-14.7%, annualized gain was 7.9% equating to a $147,896 net profit, which includes $15,475 in dividends. Only years 2002 and 2008 had negative returns of -1.0% and -2.4%, respectively.